When a popular local restaurant became interested in adding my carrot cake cupcakes to their menu, I made the decision to start a vegan baking company specializing in homestyle gourmet cupcakes. The first thing I needed was an identity that would help me to stand out and look professional when selling my baked goods. The mark needed to be suggestive of an old-fashioned homestyle bakery but still feel modern. These weren't your trendy designer cupcakes—taste was at the heart of the entire mission. People would try a Sweeties cupcake and keep coming back for more because they reminded them of the baked goods Mom made growing up. Sweeties still needed to feel like a modern brand but, instead of fashion and trend, tell the story of a small bakery with craft and homestyle taste at it's heart. So a clean design with a modern pop of orange was selected, and the mark was applied to stationery and business cards that evoked the feel of a recipe card. The brand was set to be launched in May of 2010 at a local food market. With a shoestring budget and not a lot of time, I pulled together a photo shoot to get some polished images of the cupcakes. To build up interest, I created teaser invitations to hand out at neighborhood restaurants and stores that were good candidates for stocking Sweeties. The invitations were handed out in person, and then sent again via email shortly before the launch date. 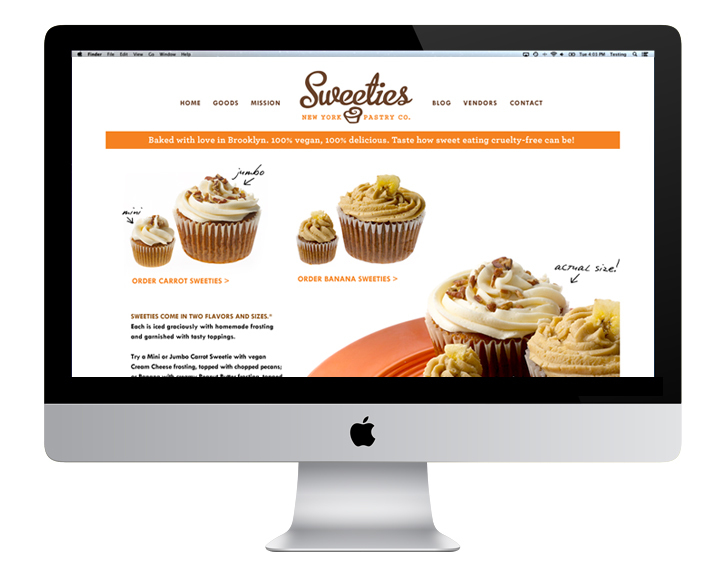 A website was launched to give customers more information about the brand. And to keep with the DIY theme, the Sweeties logo was applied to take-away boxes and bags with a custom-made rubber stamp. The Sweeties secret? They were vegan... And yet they tasted just like Mom's homemade baked goods! The launch was a success. We sold nearly every cupcake we went to market with, with accolades, and the invitations brought in a handful of the businesses they targeted. Sweeties gained attention from a local vegan publication and was given a glowing review and write-up on their website. Unfortunately, the pressures of the cost of running a business and launching Sweeties to scale were enormous. And with such a newly-saturated local food start-up market, the risks outweighed the benefits. So I made the decision to put Sweeties on the backburner for the time being. How do you sell a process that's built on partnership when one half of the partnership isn't usually thrilled about working with the other? TNS Canada came to the Marketing and Creative team in New York with this very problem to solve. Traditionally, agency creatives tend to view market research with disdain—they feel it gets in their way and obstructs the creative process. But the reality is, Research and Creative are better together. Research has the power to make Creative stronger when both are partnered and working in tandem. The inspirational piece was a conversation-starter, to help our internal clients get their foot in the door with agency partners by removing attitudinal barriers and inspiring an upbeat dialogue based around partnership. The realization that we didn't need a huge budget or flashy components—just an idea that our stakeholders could easily exemplify, which is exactly what they did—was much simpler than expected. And it paid off immediately, winning $1.3M of business just over the first few months after launch. Making meaning is the foundation of good visual design and communication. Visual semiotics—the study of meaning in signs—helps us tell stories that communicate better and have greater persuasive power. Semiotics is also very closely linked to design language. Understanding both and the way they are linked makes us all better visual communicators. With that in mind, I developed a presentation and embarked on a mission to improve the way we were using visuals in our deliverables at TNS. What started as a successful small-scale webinar became a successful workshop that I set out on a three-month "tour" across TNS offices in North America to present to our colleagues. To have the opportunity to engage people around design and the way we use visuals to communicate—and get them thinking in new ways—was extremely rewarding and taught me a lot, too. TNS launched Growth Point in June of 2015, a first-of-it's-kind ranking of growth potential that we generate from thousands of consumer interviews, covering 250 food and beverage products. This ranking provides fast, reliable, consumer-derived direction to businesses on where the greatest growth opportunities exist before they spend research dollars. The only thing missing was a name and memorable key visual. Creative Services worked with Marketing partners to thoroughly understand the growth potential ranking's purpose and what benefit it brings to businesses. Then we went away and explored some creative solutions to visuals. Our exploration lead us to three principal concepts, or ideas. Then a broad list of names was drawn up before being narrowed down to just one name per idea. We drilled down deeper around our idea keywords and created simple, bold graphics to serve as our key images. Then we chose photographic imagery that would breathe life into each idea across all applications. In the end, the idea of TNS's growth potential ranking being a guide won out with internal stakeholders. 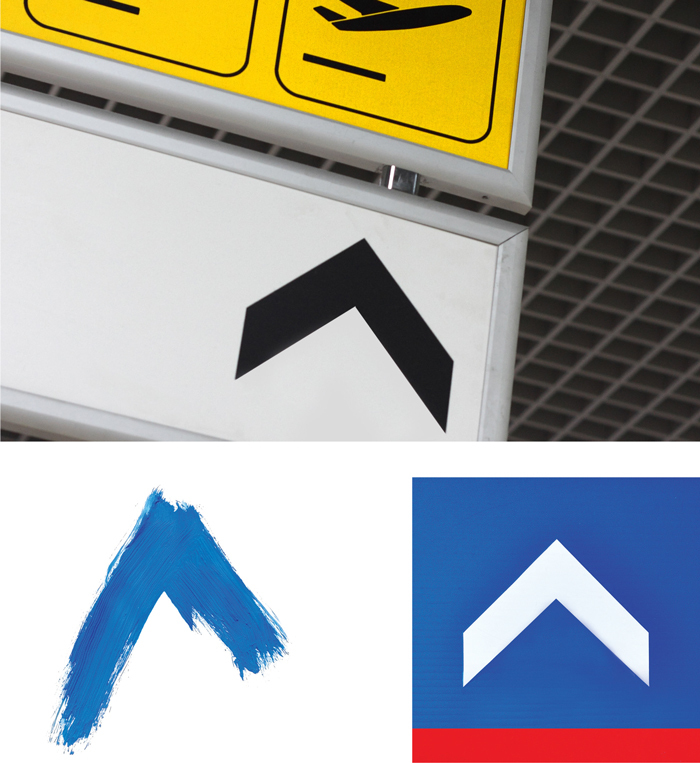 The name Growth Point, along with a compass-inspired key visual and directional imagery, was selected. Growth Point and the accompanying imagery first came alive during the launch as part of a website, summary sheet and magazine article, where we were able to show off the top 20 growth potential rankings for both the Snack and Beverage categories. This sets the stage for additional applications as Growth Point evolves. When HR wanted to launch TNS Global's four corporate Beliefs in North America, they were looking for a more "human" approach. We'd been supplied with illustrations from our Global creative team, and behavioral guidelines on how to embody the Beliefs by Global HR. So to help make the launch something special, we gave North America HR a concept that would incorporate the Global materials, and inspire a culture change by allowing employees to own the Beliefs and helping us all to connect better across 25 offices in the US and Canada. The brief was solved by putting 20 of our people who were nominated by their managers as most embodying the Beliefs in pictures, and allowing the opportunity for others to join in on the fun! With help from HR and a handful of photographers across the country, we created posters that show each of the nominated employees and how they individually embody one of the Beliefs in their own way, to inspire the group as a whole. The initial series of 20 TNS Beliefs posters were unveiled following a company webinar that announced and explained the Beliefs. Each office received a set of four 18 x 24 posters to hang, and a new set will be created and distributed quarterly going forward with new employees featured. We made sure that each office got posters featuring employees located in other offices—now we can all "meet" and be inspired by each other across the business. But it didn't end there. HR also launched an employee recognition program that aligned with the Beliefs. Part of the program included a way for employees to recognize each other, and encourage each other to be shining examples of our Beliefs: the Best @ TNS Note. Both a hard copy and electronic version of the Best @ TNS Note were designed. And we saw an opportunity to incorporate social media to get everyone even more connected and excited about using the Notes. So a Best @ TNS Instagram account was created—any time someone receives a Note, their picture is taken and uploaded to the Instagram account. Now we're all connecting and sharing photos of each other being The Best! The challenge of changing the culture in a global organization as large as TNS is immense. But little by little we're making a difference, together. Everything was crafty and DIY, but it was by far the most fun I've had creating an identity and art direction for an event!